Complete series of 37 documentaries on individual disks, ideal for libraries and educational purposes. 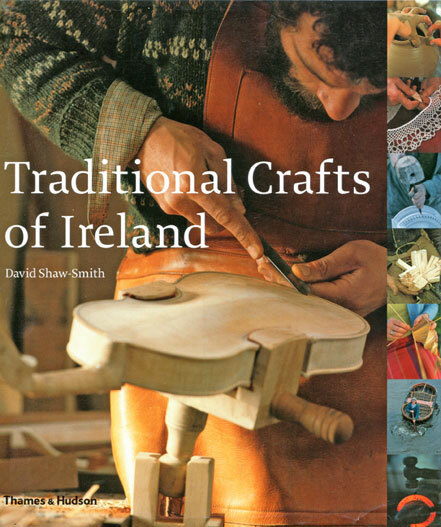 Includes accompanying book, Traditional Crafts of Ireland. €500.00 Please contact us for specific p & p costs. WOOL SPINNING – Demonstrates the big and small wheel, hand spinning & dyeing techniques. IRISH LACE – The history of Irish lace including sequences showing the creation of different types of lace. IRISH EMBROIDERY – Includes the social history, numerous making sequences, historical collections, and embroidery agents. DONEGAL WEAVERS – Features the work of out-weavers and farmers, providing a rare glimpse of a life style and a practice now disappearing. WOOLLEN MILL – At the Old mill on the River Camac, Dublin we see designing, mule-spinning, blending & hand- weaving tweed, washing & finishing. DONEGAL CARPETS – Demonstrates the process of dying wool & making a hand-knotted carpet at this well-known Killybegs, Co. Donegal establishment. TAILOR – Features Michael Johnson, a bespoke tailor from an old family establishment in Tullow, Co. Carlow, making and fitting a suit for a customer using traditional techniques. ENGLISH SILK (1 hour) – This award-winning, one hour special covers the complete story from the life cycle & rearing of silkworms, and the rare process of reeling silk from the cocoon to traditional spinning & weaving of silk, and hand-block making & printing. CARRIAGE BUILDING – Breen’s Carriageworks, Enniscorthy, Co. Wexford. We see the five trades – wood-turner/ bodybuilder, wheelwright, blacksmith, painter & upholsterer that combine in making of traps, gigs & landaus in the traditional manner. CAVAN CABINETMAKERS – This fascinating film about the Robinson brothers of Milltown, Co. Cavan shows the fine craftsmanship that goes into the making of a dining-room suite, including intarsia and inlay work. CAVAN COOPER – A unique film about the remarkable Ned Gavin, the last of the Country Coopers, his philosophy and craft including stave-built churns & barrels. CHAIRMAKER JOHN SURLIS – Features the making of ‘the Leitrim chair’, a rustic slab & stick chair using cleft Ash, the drawknife & the coopers mare. DUBLIN’S VIKING LONGSHIP (1 hour) – This one-hour programme follows the course of a community project to build a Viking Longship in celebration of Dublin’s millennium. We travel with the builders from the Ship museum in Oslo, through the building sequence to the inaugural voyage. HARP MAKING – The Forgotten Sound – In Kenmare, Co. Kerry we see the making of the wire-strung low-headed Irish harp of antiquity, including film of the historic Brian Boru harp in Trinity College, Dublin. HURL MAKING – Starting with the selection of the Ash tree we follow traditional techniques, including use of a water-powered sawmill and the making of the sliotar (leather ball) culminating in the all-Ireland final. IRISH SPINNINGWHEEL MAKING – Demonstrates the construction in Carndonagh, Co Donegal of the small or low spinning wheel, first introduced into Ireland in the 17th century for spinning flax. Includes spinning sequences. SHANNON ONE DESIGN – In Lecarrow, Co. Roscommon we see Jimmy Furey building a traditional lake & river Shannon sailing boat including selection of timber, steam bending & sailing. CARLIES BRIDGE POTTERIES – From Irelands oldest pottery Est.1659 in Enniscorthy, Co.Wexford, the film features master-potter Paddy Murphy digging the clay, and throwing & firing earthenware in a coal-fired beehive kiln. BELLEEK POTTERIES (1 hour) – This one hour special tells the history of the famous Belleek Pottery, Co. Fermanagh, and shows traditional techniques including hand-modelling of Parian ware, slip casting and fettling. PIPE WORKS – A fascinating & rare film on the complete production of industrial clay drainage pipes and hand made Armstrong junctions, all fired in the largest beehive kiln in Ireland at Kingscourt, Co. Cavan. A DUBLIN SILVERSMITH – Features spinning & raising silver, snarling, chasing & piercing, casting hollowware, and making a silver teapot. POWERS OF THE METAL – This entertaining and unusual film shows the Power family from New Ross, Co. Wexford casting a nineteenth-century garden seat, includes other sand-casting & foundry work. STONE – This film shows the life and work of Dublin and Wicklow Quarry men, stonecutters, masons & carvers, including the carving of decorative marble panels, and laying of cobblestones. DUBLIN’S WORKHORSES – In this film of Dublin street life we see the work of farriers shoeing the horses, & traditional harness & collar making. SHOEMAKING – Features the craft of George Tuttie from Naas, Co. Kildare. We see the making of handmade shoes from the measure, fitting up the wooden last, sewing the uppers, & building the sole. A DUBLIN BOOKBINDER – Demonstrates the ancient craft of bookbinding including designing the covers, sewing the gathers, gilding & burnishing, tooling & restoration. Also shows collection from Marsh’s library, Dublin. THE SADDLER – From the Bernies’ long established family firm in Kilcullen, Co. Kildare the film shows the traditional hand making of saddles and bridles. CURRACHS – This film shows Ireland’s prehistoric skin boats, their regional variations, use & construction, including the rare Co. Donegal paddled currach. RUSHWORK – In Strokestown, Co. Roscommon we see harvesting of rushes on Lough Ree, curing and making traditional rush baskets & other items. BASKETMAKING – Features the Shanahan brothers of Carrick-on-Suir, the last of the old-style professional basketmakers. Shows the preparation & making of traditional baskets from eel-traps to balloon baskets. WEXFORD THATCHER – Demonstrates the full cycle from harvesting, steam threshing, scollop-making and thatching at Cleary’s town & Kilmore Quay, Co Wexford. FERMANAGH COUNTRY – This historic & unique documentary records the Mulholland family from Co. Fermanagh in a traditional Irish lifestyle long gone. 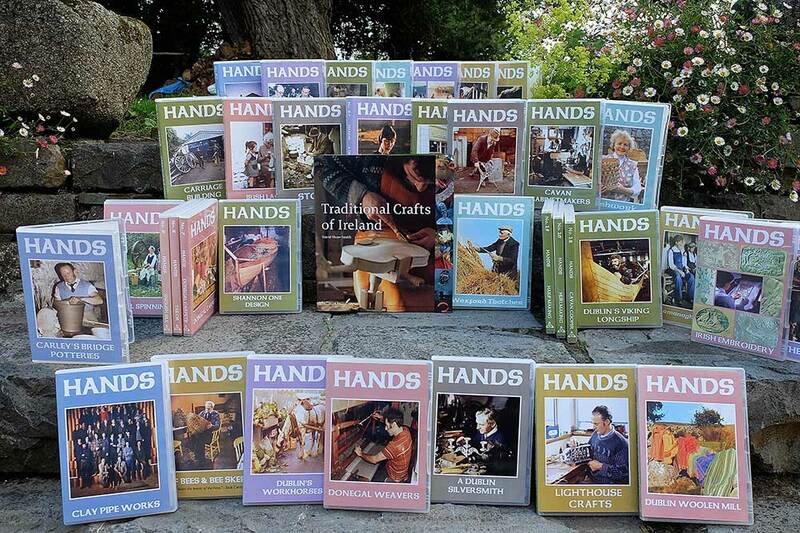 It includes farming, quarrying, and making circular grinding wheels & whetstones for sharpening scythes. STONEGROUND – Martry Mill was established near Kells Co. Meath in 1659. It is owned by the Tallon family. The film shows the waterwheel, mill machinery, millstone dressing, and the milling process. A DUBLIN CANDLEMAKER – Features Rathborne, wax-chandlers, Dublin’s oldest company established in 1488. Shows the fascinating processes of making hand-poured & dipped candles. OF BEES & BEE SKEPS – Winner of the Golden Harp for Ireland, and in the Museum of Modern Art collection, New York, this arresting & moving documentary records the traditional work of bee-keeping from making a straw skep to catching a swarm, and extracting honey. LIGHTHOUSE CRAFTS – Filmed on some of Ireland’s most famous lighthouses, including the Fastnet rock, this film captures the closing years of the lighthouse keepers, their way of life and crafts.